In Wednesday's night tilt between North Dakota and Northern Colorado, there was about 37 minutes of tight defense and inconsistent offensive play. UND took a lead into halftime, UNC came out in the second half and led by as much as 11, and the rest of the game was a tight, back and forth affair. After a flurry of buckets back and forth, Northern Colorado led 61-60 with the ball late. Tevin Svihovec made only one of two, giving UND the ball down 62-60 with 18 seconds to play. After working the ball around, it made its way to Aaron Anderson, and the junior guard delivered. He buried a back breaking three. On the ensuing possession, Tate Unruh tried to make something happen, but got the ball stolen. After making 1 of 2, the Bears needed to go the length of the court in 1.8 seconds. Remarkably, they got off a great shot. The ball got tipped to Tim Huskisson, who had what seemed to be a wide open layup (would like to see a replay), but he missed it as the buzzer went off. It looked like he was a bit surprised to actually get the ball right there, in that spot. With the miss, UND won the game 64-62. 1) North Dakota was shorthanded, as Brandon Brekke and Josh Schuler did not make the trip because of injuries. If you're keeping track at home, that's their fourth and fifth leading scorers. 2) It was a game that North Dakota wanted to win, obviously, but a game that Northern Colorado NEEDED to win. The loss drops them to 7-10 in the Big Sky. That means they almost certainly will need to split their road games next week (at Eastern Washington and Portland State), and then beat Southern Utah at home. - Troy Huff was not at his best (19 points on 6/18 FG, two rebounds), but he stayed aggressive down the stretch and made some nice plays. 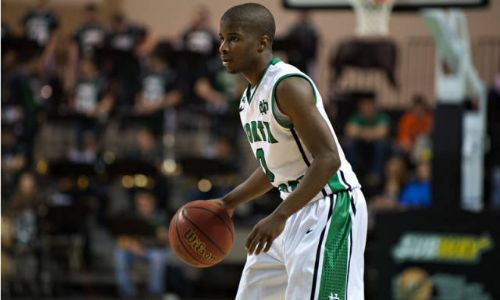 Plus, his drive and two-handed slam was perhaps the most athletic play in the Big Sky this year. That or this allep oop slam he had earlier in the year. - Apart from the last three, Anderson was solid. He was money down the stretch from the line, finishing 7/7 from the stripe. Even though he was only 1/5 from deep. He had 21 points, six rebounds, and five assists. He is a really good all-around player. - Connor Osborne had his best game of the season, finishing with 19 points and 6 rebounds, including some huge plays down the stretch. Derrick Barden didn't really stand out, and finished with 14 points and 11 rebounds. That is a compliment. Makes tons of plays every night, and it has become commonplace. - Tevin Svihovec was very shaky down the stretch. He got swiped by Jamal Webb, almost got swiped by Troy Huff, and badly missed a FT in the final 20 seconds. If UNC will take the next step, Svihovec has to take the next step. No other way to say it. - Tate Unruh is a fine player, but this had to be one of the worst games of his life. He was 2/11 from the floor, and 0/5 from downtown. If you are BJ Hill, you want him to keep shooting... they just weren't falling tonight. It was shocking to see because he is such a great shooter. Anything other thoughts on this game? These are the two teams that will be able to contend next year, and will help improve the Big Sky's fortunes. UNCO really needs to get better security from its 1. Svihovec must get better. Beitzel was quickly becoming a start at the end of his Soph year, whereas Svihovec is becoming more and more of a liability. As opposing teams want to see the ball in his hands at the end. What are the other options for the Bears? Tucker? Davis? That's the rub... Tucker is not really a pure PG... he does a lot of things well but he is not a great ballhandler or shooter yet. I thought Davis would get more time this year... he is a solid defender but is pretty limited offensively. Paul Garnica is an option for next year... but he is like JR Smith - you get great plays and really bad plays from him. One interesting option is Jordan Wilson who is coming in next year - http://espn.go.com/college-sports/basketball/recruiting/player/_/id/104534/jordan-wilson . Heard good things about him but think it is probably way too much to ask for him to really be that guy next year. Bottom line, they have to have Svihovec develop. But right now, he doesn't necessarily look better than he did last year at this time. Clearly North Dakota was the better team (in the final 30 seconds) last night. Go Sioux!